Formed in 1993 as a specialist vacuum engineering company to provide custom made medium and high vacuum systems, the company rapidly developed its business and within a few years had established an unrivalled reputation for innovative design and manufacture of a broad range of custom vacuum systems. The demand for these systems came from a wide range of industrial and academic customers, including many blue chip companies and world-leading universities. West Technology are UK agents/distributors for leading vacuum equipment manufacturers including Pfeiffer Vacuum, Busch Vacuum, Mil’s France and MKS Instruments. This broad range of vacuum equipment enables us to offer a comprehensive range of specialist vacuum products and services. Mushroom Internet built two sites for West Tech in 2016 and were approached by the company requiring digital marketing campaigns to raise their online profile. Their social media was managed in house so our focus was on ensuring all the onsite content was well optimised and building a back link footprint for the site. We explored new opportunities to link back to the site and encouraged West Tech to provide us with new content to optimise. This dual approach has had successful results so early on in the campaigns. We were approached by West Tech who required digital marketing campaigns to raise their online profile. Their social media was managed in-house so our focus was on ensuring all the on-site content was well optimised and building a back link footprint for the site. We explored new opportunities to link back to the site and encouraged West Tech to provide us with new content to optimise. This dual approach has had successful results so early on in the campaigns. We approached Mushroom in early 2016 to design a new website for us. 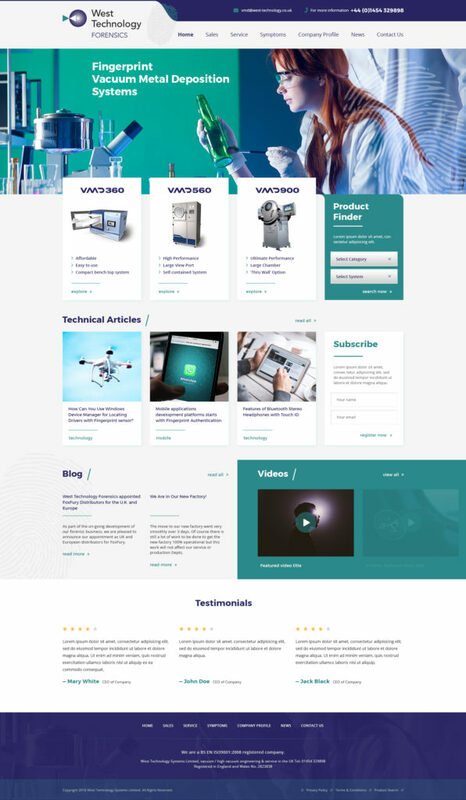 One of the key aims of the new website was to make it much easier for our customers to navigate to either our industrial or forensic products. Mushroom were very professional and knowledgeable in their approach to the task and we are delighted with the final website. Their expertise in SEO has been critical in raising our profile of our new website in the ranking and we are very happy to continue to work with Mushroom.